1. Carl Hiaasen, Skink — No Surrender — I’ve had an ARC of this book since Book Expo America 2014. Time to finally read it! 3. Neil Gaiman, The Ocean at the End of the Lane — Halloween is the perfect time for some creepy, magical Neil Gaiman. 4. Leigh Bardugo, Crooked Kingdom — I wasn’t blown away by the Grisha trilogy, but I loved Six of Crows and am dying to find out what happens to everyone in this sequel! 5. Shirley Jackson, We Have Always Lived in the Castle — I’ve never read anything by Shirley Jackson but have always been curious. My impression is that her books will be creepy enough to get me in the autumnal spirit without actually, you know, terrifying me. 6. Emma Mills, This Adventure Ends — I thought First & Then was very cute, so I’m definitely looking forward to reading Mills’s new book! 7. Connie Willis, Crosstalk — My most anticipated release of 2016 by a mile! I’m such a Connie Willis fan, and this techno-rom-com sounds right up my alley! 8. Donna Moore, Old Dogs — The description of this one caught my eye: “Two septugenarian sisters take the classic heist to new levels in this addictive caper.” Sounds delightful, no? 9. Kasie West, P.S. I Like You — A young adult version of “You’ve Got Mail” is the perfect book for Hour 22 of the readathon! 10. Lindsey Kelk, We Were on a Break — Huzzah, a new Lindsey Kelk book is coming out! Obviously I’ll need to read it immediately. I loved The Ocean at the End of the Lane and We Have Always Lived in the Castle. I’ve heard great things about Kristoff and Willis. Enjoy your other reads! YES! We Have Always Lived In The Castle, is a GREAT book! 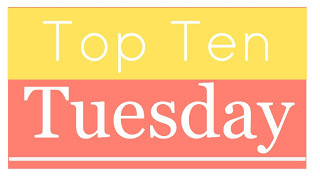 I hope you enjoy it as much as I did 😀 My Top Ten Tuesday! I like your # 9 pick. I haven’t heard of this one but I loved the You’ve Got Mail movie so I’d be interested in anything with a similar theme. Yay for our buddy read!! !